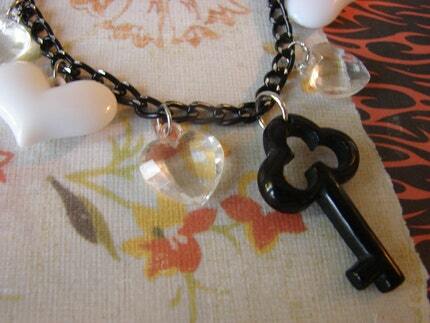 A black lucite key charm, white lucite heart charms, and clear faceted sparkly acrylic heart charms dangle from an 18" black metal chain that closes with a lobster clasp. The key is about 1 4/4" long, white hearts about 1 1/8" across, and the clear hearts are about 5/8". The jumprings used to attach the charms and clasps have been soldered shut. This necklace sells for 12.00 and is currently available at my etsy shop: http://geelizzie.etsy.com.